The Barcelo San Jose Palacio Spa & Casino is a luxury accommodation in every sense of the word. Located just 10 minutes from the airport and only 10 minutes from downtown San Jose in a quiet residential area. 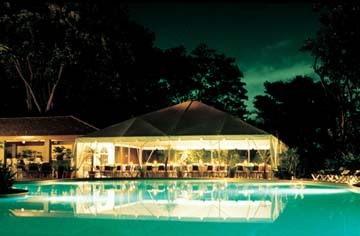 This is the ideal place for combining pleasure with business, located close to the "Braulio Carrillo" National Park. The San Jose Palacio Spa & Casino has 8 floors with 254 luxury rooms and suites. 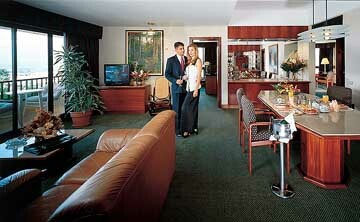 There are 194 standard rooms, 37 executive standard rooms, 22 junior suites and 1 presidential suite. Each room and suite has direct dial telephone, direct internet line, cable television, hair dryer, mini bar, safety deposit box, cribs available, coffee makers and 110v electricity. The Executive Floor Service includes: independent registration, complimentary continental breakfast, private fax, secretarial pool and business center. 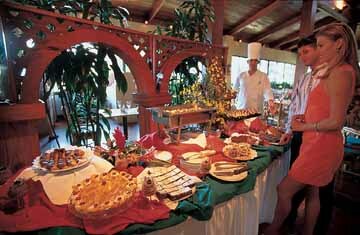 Dining possibilities are varied - a poolside "El Rancho" grill, a lobby piano bar, cafeteria, formal restaurant "El Bosque Bar" and live music and entertainment. On the grounds of the San Jose Palacio you will find outdoor swimming, children's pool, gym, spa, sauna, Jacuzzi, massage, 2 tennis courts, 3 racquetball and squash courts. For your convenience and pleasure there is a casino, boutique and gift shop, jewelers, leather shop, hair salon, 24-hour room service, laundry service and airport transfer service every 30 minutes. The San Jose Palacio has meeting rooms to accommodate from 10 to 1,200 attendees, with 2 executive dining rooms for private service. Barcelo has many hotels with the capacity to arrange meetings, congresses and incentive trips with a wide variety of destinations and facilities to organize a full program in accordance with your requirements. The highly qualified staff with extensive experience can provide every service: conventions, congresses, incentives, seminars, banquets or working lunches. Barcelo knows the requirements of those who travel constantly for professional reasons which is why there are designated efficient Executive Floors to facilitate such stays. References of conferences held include: Amway (850), Microsoft (200), Seminarios Intel (1200), Chiquit Brands (1200), Conferencia International 1000 (1200), Merck Sharp & Dome (900), Ericcson (850), Siemens (500), Motorola (1000), Embajada USA (110), Yamaha (600, Unisys (950). Shopping for Costa Rican craftsmanship is a varied experience. A wide variety of goods which reflect the country's typical traditions and features, ranging from replicas of pre-columbian objects or the traditional Costa Rican cart up to the modern, elegant designs. Wood and clay sculptures, pottery, leather goods, jewelry and wickerwork are also to be found. 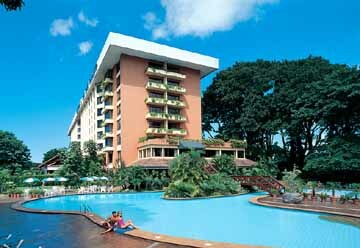 The weather averages at 85 degrees F. Your visit to Costa Rica may be for pleasure, relaxation or business... a Barcelo Hotel and Resort and Casino is ready to accommodate you.